Point motors are expensive and fitting them under baseboards takes time which often holds up layout construction. Here’s a great way to get your track laid now while still allowing point motors to be fitted later but without relaying the track. 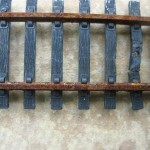 This is another great tip from the members of the Model Railway Engineer Builder’s community. It came up during a recent discussion about fitting point motors. The conversation expanded into their cost: point motors aren’t cheap and to equip an entire layout the cost can quickly become significant. It’s also time-consuming. If only there was a way to lay track and points now and retrofit the point motors later? And a technique to do just this is precisely what several members suggested. Just one point motor is purchased and this is used for sizing and positioning of all the all the locations you want powered points. The holes are then drilled (for the drive rods) and the track laid. In this way, the track can be put down and the points operated normally — Hand of God etc — so you can get on with the layout. Later, when you have more time or money, the point motors can be added without too much disruption. Thanks to Allan, Jonathan and David for their suggestions. 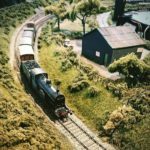 The Model Railway Engineer Builders community is free to join and provides a safe, friendly, forum where you can get answers to problems, share your progress and help others with their model trains and layouts. To join click on this link and click on Join. Great suggestion. I’m going to do this on my new layout. 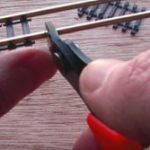 Good idea but would it work for n gauge points that don’t have a centre hole for a pin to go through?